The predominant cause of accidents with tourist drivers in Namibia is excessive speed on well-maintained gravel roads without there being another vehicle involved. A further cause of accidents is lack of concentration due to overly long driving times and low traffic density. 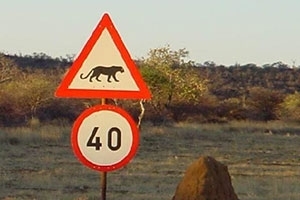 Gravel roads are unpredictable and we strongly recommend you pay careful attention to traffic signs, even the funny looking ones that have elephants, giraffes or warthogs painted on them. 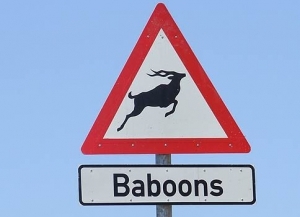 Those signs are not there to make you smile -although that’s a bonus- but because the animals in question roam there. Your 4×4 vehicle is equipped with large fuel tanks and a water tank. Please make sure you keep them filled up at every available opportunity. Avoid driving at night. Our wildlife doesn’t carry reflectors and they are really hard to see in the dark. You know the traffic regulations but can’t see the animals; the animals can see you but don’t know the traffic regulations. It’s a no – win situation. Don’t drive for longer than 4 hours per day or more than 300km per day, whichever comes first. Driving in an environment you are not acquainted with will make you tired sooner than you think and you’ll lose concentration fast. Anyway, what’s the use of having been to places you haven’t really seen? Always engage 4×4 High when driving on gravel and dirt roads. The all-wheel drive gives your vehicle a lot more stability and traction. Don’t forget to disengage when joining a paved road again! Check your tyre pressure regularly. For prolonged gravel road driving your tyres should be at 1.8 – 2.0kpa and that’s less than the 2.4kpa recommended for high-speed paved roads. For soft sand or rocky terrain low-speed off-road driving your tyre pressure should be around 1.4kpa. Check on your spare wheels daily and make sure they’re OK. Good spare wheels come in very handy in case of a flat on your vehicle. Don’t drive too close up to wildlife. When they’re smaller than you the chances are they will run away and you won’t see them again. When they’re larger than you there’s the possibility they will force you into a panicky reverse. 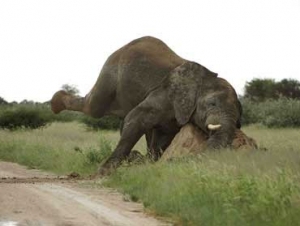 No off-road vehicle has ever won it from an elephant! Be aware of very slippery roads in rainy weather conditions. Water makes sand turn into mud and it is notoriously difficult to keep control of your vehicle in mud. Many accidents happen because drivers can’t brake in time for animals on the road and try to avoid a collision by turning sharp away from them thereby losing control and often rolling their vehicle. Don’t do this! Go slow so you can brake in time or, if the animal is rather small, hit it head on. You have a protective bull bar for such incidence. The magic words here are “rather small”; it doesn’t work with rhinos or elephants. It is advisable to participate in a 4×4 course in your home country or in Namibia, even for those who drive a 4×4 vehicle at home. Driving a 4×4 off road in the wilderness is surprisingly different from driving one to work in town. Remember you’re on holiday. Take it easy and enjoy the astounding nature and fascinating scenery. Have fun!